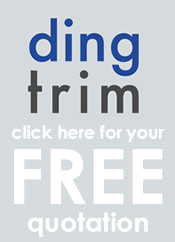 With over 25 years experience as a local non franchise Smart Repair Company, Dingtrim offer a comprehensive mobile repair service. Covering Ipswich, Woodbridge, Felixstowe and the surrounding area repairs can be carried out at your home or work place so that you don’t have to be without your vehicle. Significant savings can be made on bodyshop costs and repairs can cost less than insurance policies excess. You can be confident that repairs are carried out to the highest standards. Getting a quote is easy, either call us on 07850405445 or 07850405446 and arrange a visit, or you can text or email us a photo of the damage.